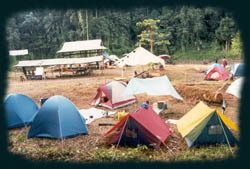 Camping and Jungle Trekking. If outdoor activities are your cup of tea, Tasik Kenyir provides an ideal rendezvous with beautiful mother nature and peaceful camp-sites are plentiful in and around the lake. Popular spots are along the rivers of Saok, Lasir, Cacing, Chicir, Leban, Pertang, Terenggan, Tembat and Pulau Poh (KOLA). Should you decide on jungle trekking, please consult your tour guide (boat / chalet operators) for the best track and location. One of the most popular trails is Mount Gagau. 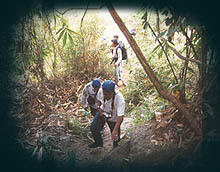 Trekkers are advised to engage a jungle guide.